Not only babies who use diapers, adults sometimes use it, especially elderly people. 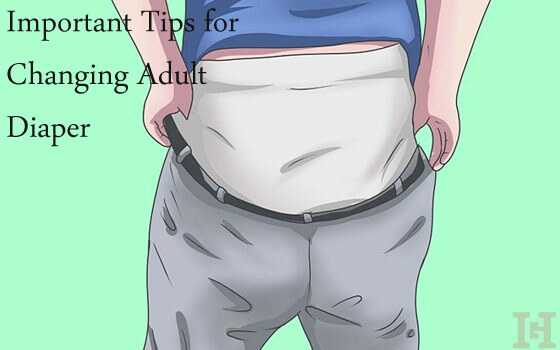 The use of adult diapers is usually due to several conditions, such as urinary incontinence, prostate enlargement ( Benign Prostatic Hyperplasia / BPH), or post-stroke brain damage. Too frequent urination or cannot resist urination, can interfere with activities during the day, and interfere with rest when sleeping at night. Especially if accompanied by limitations in the move. In people with these conditions, it is advisable to use adult diapers, so as not to get tired back and forth to the toilet and not wet clothes or bed. Normally, the frequency of urination is 4-10 times a day. However, urination can become more frequent, if you experience some of the following conditions. The most common reason that a person needs to use an adult diaper is urinary incontinence. Urinary incontinence is the loss of control of the urinary process. As we get older, the muscles around the bladder and urinary tract begin to decrease in strength. This results in a decrease in the ability to withstand the release of urine. The severity of each person can vary. In fact, urine may leak or come out when sneezing or coughing. This condition generally occurs in the elderly, but it is possible to happen to anyone. The use of adult diapers is recommended for those of you who experience this condition. Growing age causes the body organs to change. In men, the most common is the occurrence of prostate enlargement or BPH. BPH can make a person difficult to control the release of urine, causing urination unconsciously. Brain Damage After a stroke, getting out of bed and going to the bathroom may not be as easy as before. Patients with stroke often also have difficulty in controlling urination (BAK) or defecate (BAB). Post-stroke, the muscle that controls the bladder can become weak. In addition, the nerves that send and receive messages from the brain associated with the desire to BAK and BAB experience interference, so that the release of urine and feces become uncontrolled. This situation makes stroke sufferers need to use adult diapers. In addition, there are other conditions that can be helped by using adult diapers, for example during recovery after surgery, bed rest, or in the elderly with dementia who have difficulty in controlling the function of urination or defecation. If urine leak is often a problem and has disrupted the activity and quality of sleep, then the use of adult diapers is recommended. Here are some tips to use. Choose an adult diaper with a soft material that is comfortable to use for a long time and does not cause skin irritation, and has a good absorptive capacity rather than leaky nappy. As soon as possible after BAK or BAB, it is advisable to change adult diapers, to stay comfortable and prevent unpleasant smells from urine and feces. In addition, also to avoid disruption in the skin that is covered with diapers. This is to maintain comfort when using adult diapers. In order not to be too visible, choose clothes that are dark, so the use of adult diapers do not interfere with appearance. You can apply moisturizer to keep skin moist in the groin area and buttocks, and to prevent irritation or other skin problems that can occur due to frequent exposure to urine and feces. Damage to soft tissue and skin in the elderly is very common, due to decreased skin resistance and general physical condition. Health disorders that limit movement, can exacerbate this. Therefore, the hygiene of elderly skin should be well preserved to prevent the risk of infection. The use of a good adult diaper with proper care will reduce the risk of infection and skin problems caused by recurrent urine and fetal exposure. With a wide selection of adult diapers on the market, you are advised to be careful in choosing a good quality adult diaper. The use of dry, antibacterial diapers can help in inhibiting bacterial growth and prevent skin irritation. Skin irritation can occur due to long time not to change the adult diaper because the wearer is resting sleep, or because it is long in the journey ( traveling ). Choose a diaper with high absorption that can prevent the return of liquid to the surface of the diaper, and made from soft so comfortable to use and safe for the skin.